During a recent trip to London, we had to change trains at the Elephant and Castle station and our train was delayed. There is a shopping centre and bowling alley adjacent to the station and my wife suggested we take a look to see if there were any arcade games. As it turned out my wife’s arcade game finding senses must have been finely tuned that day! The bowling alley had a surprising number of modern arcade games. However it was The Ocean Hunter: The Seven Seas Adventure which really caught my attention. The Ocean Hunter was developed by Sega AM1, released in 1998, and runs on Sega Model 3 Step 2.1 hardware. The game is played by using two mounted turret-like Shock Guns on the arcade cabinet, and follows two underwater adventurers as they head out to defeat the Seven Great Monsters of the Seven Seas. I had only seen this game once a few years ago in Southend, but it was broken. It was great to finally play it! I really liked the underwater / sea monster theme. The enemy creatures were well designed and the first two boss battles were great, unfortunately we didn’t make it to the third! I liked how the outcome of in game events would trigger certain actions. For example, on stage one Sea Dragon, a reptilian creature is only encountered if the diver chased by a great white shark is rescued. Also the soundtrack is very good and suits the game perfectly. I really enjoyed my couple of credits. It’s a fun game and still looks good today. I’m surprised so few were produced. It could be that Sega thought it might be a bit too niche like Brave Firefighters and Planet Harriers and were less prone on taking risks, especially in light of the late nineties declining arcade market. The shopping centre also had a nice oriental supermarket so we were able to stock up on some tasty goodies. We went on a trip along the Suffolk coast, checking out the arcades and holiday parks along the way. Fortunately there were some nice surprises in store. This holiday park had a nice selection of modern games, but the biggest surprise was Tekken 6 on the Namco Noir cabinet. This didn’t look the type of venue that would have arcade games, at least nothing old. I was pleasantly surprised. To say I was shocked to find Turbo OutRun would be an understatement! There are two piers with the usual selection of modern racing and shooting games. I was really pleased to see the awesome Star Wars Racer Arcade in Claremont pier. There can’t be many of these about now. The game is powered by the mighty Hikaru board, the same system as Brave Firefighters and Planet Harriers. The machine was in really good condition. My arcade machine finding senses must have been finely tuned this day! As we were about to leave Kessingland, I spied this pub and decided to check it out. The pub had a modern multi-game cocktail cabinet, but tucked away in the corner next to the quiz machine was something far more interesting. The machine was in lovely condition, with a nice bright monitor and played really well. The first time I’ve seen a dedicated Soul Calibur machine. The pier has an arcade, as well as ‘Under The Pier Show’, a collection of hand-built machines. It was great to have a go on Airline Pilots DLX triple screen cabinet, although sadly the central monitor had a fault, having a green tinge. The ‘Under The Pier Show’ machines certainly had some novel ideas. Our final destination along the coast of Suffolk was Felixstowe. Walking along the seafront on a cold, snowy day in January really captured the melancholy of an out of season British seaside town. 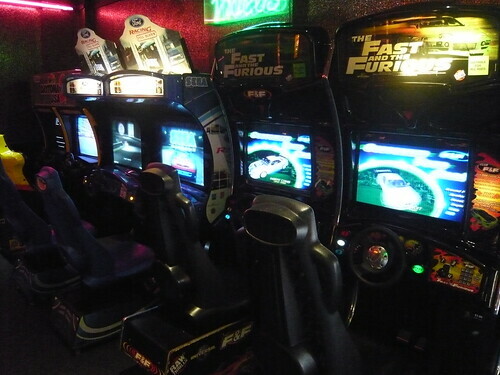 The arcades along the seafront had the usual selection of modern titles. I was pleased to see Motor Harley-Davidson Cycles and Percussion Master, by IGS which I hadn’t come across before. My two year old daughter was a little alarmed by the stools! 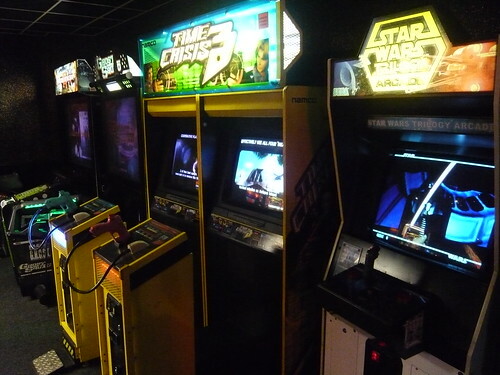 The pier had the best arcade along the seafront with a good selection of modern titles, as well as some older ones. I was really happy to find Tokyo Wars DLX and Rapid River. The rear projection screens had been replaced with LCD. I’ve got no objection to this when it means these old titles remain in service and in good working condition. Once again my wife demonstrates her awesome gaming skills! The ‘row row boat game’ was actually my daughter’s favourite game of the day. I love that ice slope bonus stage. A video and some more pics of the arcade.